If you followed us last year you will know that only about half our plan was accomplished. We made all the checkpoints, but did not make Pike's Peak and the Black Hills. This year we are trying again for them, with additions. 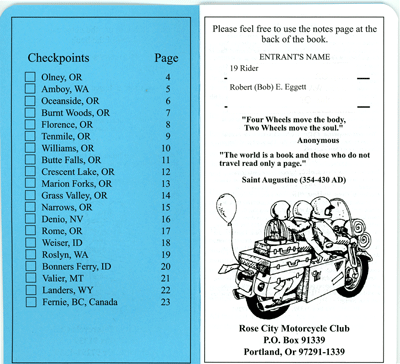 We are again doing the Grand Tour sponsored by the Rose City Motorcycle Club. The distant checkpoints this time are to the east and north. This will be fine as we are planning to meet friends from Italy at Sturgis. We will get the Wyoming checkpoint on the way there and try to do Pike's Peak and Mt Evans too. Our friends are going on to Yellowstone and Alaska after Sturgis. We will follow them as far as Calgary, Alberta getting the Montana checkpoint and then we will leave them to get the last three checkpoints, BC, Idaho, Washington. This is all in August. Before then we will take a couple of week long trips to get the Oregon checkpoints. Up to this point (early April as I write this) we have taken several one-day rides. We did the "Polar Bear Run" on January 1st. We have taken 3 or 4 "lunch" rides to the coast. We have lead a ride towards Mt. St. Helens for our GWRRA chapter's after-meeting ride. And I have taken a couple of rides without Kathy, but with a friend who also has a GoldWing. On one of these rides he and I went up the Washougal River, a windy road that is fun to ride. At the upper end we stopped at the local market for a break and I took this picture. 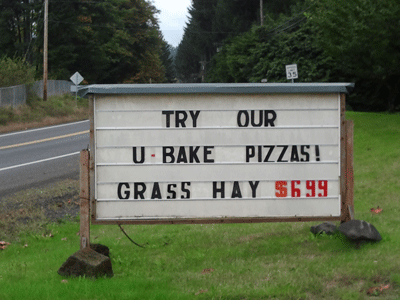 I am guessing that they ran out of Pepperoni! Anyway the ride was fun! Check back and see if we make all of the checkpoints without problems this year. We are due for a year like that!